The oldest part of the whole site is the original, free-standing four-storey castle keep, which King Richard of Cornwall had built on the north-eastern side of the Roman town wall in around 1265 (d). After Boppard was pledged to the Archbishop of Trier, Baldwin of Luxembourg in 1312, the building measures stalled for a while. Not until straight after the military repression of the town by the Archbishop in September 1327 was the tower, which presumably had been damaged, reconstructed and in 1329 (d) an additional defence storey was added. In around 1340 (d) the tower was given a steep roof and a two-storey L-shaped extension on its western side. As this building showed the Archbishop’s coat of arms on its stepped gable overlooking the Rhine, it can be said to have been the customs house. Later followed the construction of a small neighbouring building on the northern side of this customs house. The Archbishops of Trier, Kuno and Werner von Falkenstein established a chapel with elaborate murals on the upper floor of the tower at the end of the 14th century or the beginning of the 15th century. The area was restored in 1498 (d), immediately after the damage caused by the Boppard War in the summer of 1497. The Archbishop of Trier, Karl Kaspar von der Leyen had the Northwest Wing added in 1660 and 1661 (d) as well as the South Wing in 1671. After the damage caused by the Palatinate War of Succession a prestigious façade overlooking the Rhine was created under the Archbishop of Trier Johann Hugo von Orsbeck in 1694 and 1695 (d), through the construction of the North Wing and both pavilion-like corner buildings. The erection of the East Wing as well as changes to the castle keep in the years up until 1702 (d) marked the end of the rebuilding. The gap in the North Wing, immediately east of the keep, which appeared at the turn of the 19th century was only recently closed with a modern building structure. The dendrochronologically dated sample comes from a beam from the roofing structure of the North Wing. It was made from fir and shows it was felled in the summer of 1694. Such datings are identified in scientific papers with (d). 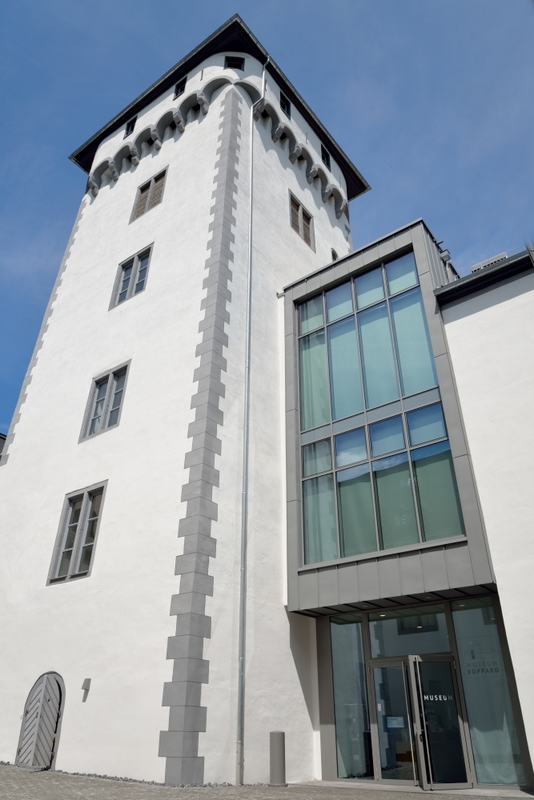 From 2010 the former electoral castle underwent complete repair and technological modernisation. On this top-class site, which is interesting for its historical development, mediaeval murals and the so-called Cologne Ceilings of the early Baroque period have been preserved. A multitude of uses and building changes had, however, considerably modified the building. Therefore the town of Boppard offered a prize for a two-phase design and building competition in 2001/2001 with the aim of closing the so-called ‘French gaps’ in the part of the building overlooking the Rhine and re-establishing the ‘potential unity’ of the castle. The Architectural firm Detmold/Berlin won first place with their suggestion of closing the gap with a cube-shaped modern structure in concrete with glass and steel façades, which then took a lot longer in the structural implementation than originally planned. Remnants of colour and plaster lent a uniform white-grey appearance to the façades from the time around 1700 until right into the 19th century. These obvious and clear detailed features, in connection with the early baroque configuration of the site, which still characterises it today, justify the decision to give it this colour from a conservation point of view. In the interior, large spatial structures from the time of construction, with subsequent installation of small parts had been preserved. The very large number of surviving Cologne ceilings is of very special, national importance. They are stuccoed timbered ceilings, which were used above all in the 17th century and the first half of the 18th century in prestigious buildings; later they were replaced by the flat ceilings. Starting in Cologne patrician houses, they turned into an ‘export success’ and came to the Rhine by way of the Archbishops of Trier. 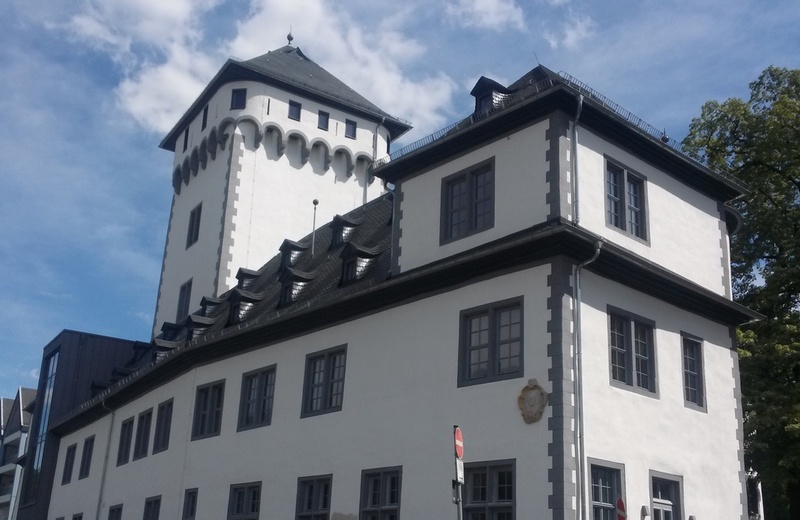 Luckily the whole colour scheme was retained in Boppard, which showed a unified choice of grey-white colours for the time of construction, even in the interior of the building. Due to the great importance of the early baroque spatial structures and the Cologne ceilings, it was therefore decided to restore the rooms and cabinets with Cologne ceilings complete with the original colours. All other rooms remain neutral. The castle’s appearance over the centuries was and still is determined by the colourful form of the walls, both internal and external. There is evidence of both small and larger traces of these colours on the building today. On the oldest part of the building, the castle keep of 1265, the stones set in the mortar were visible. Only the windows and entranceway received an approx. 40 centimetre wide strip of plaster around them. These plaster frames emphasised the openings and at the same time, protected the masonry from damp. In the following building phase from 1329 the keep and the upper defence platform were raised. The building was then plastered and lime washed and individual architectural elements were accentuated in red. In the late 14th century, a chapel was added to the fourth floor of the keep. Two of the painted walls can still be seen on the inside. The prestigious extension followed over the course of the 17th century. Whilst the façades were lime washed, painted grey corners with black joints and contour coats emphasised the edges of the building. The windows were also in a contrasting grey with a black contour coat. Other elements, such as the round-arched frieze and the wall edges, the wooden cornices, were correspondingly emphasised. The remains of brown paint emphasising architectural elements on yellow-ochre wall surfaces come from the 19th century. In around 1970 the castle was newly plastered in parts, painted white with red accents. With the revitalisation of the castle which began in 2004, the baroque white-grey colour was reinstated on the basis of extensive findings. So the overall effect of the most important building phase, the baroque construction with its four wings, could be regained. Also the way the rooms are furnished can, to a large extent, be traced back to the white-grey of the baroque extension phase. Correspondingly the Cologne ceilings were reconstructed in the rooms and cabinets. Later room settings followed the respective tastes of the time. The restoration phase of the time around the 1800s with colourfully painted plinths and wall mirrors with detailed paintings of flowers and tendrils should be particularly highlighted. 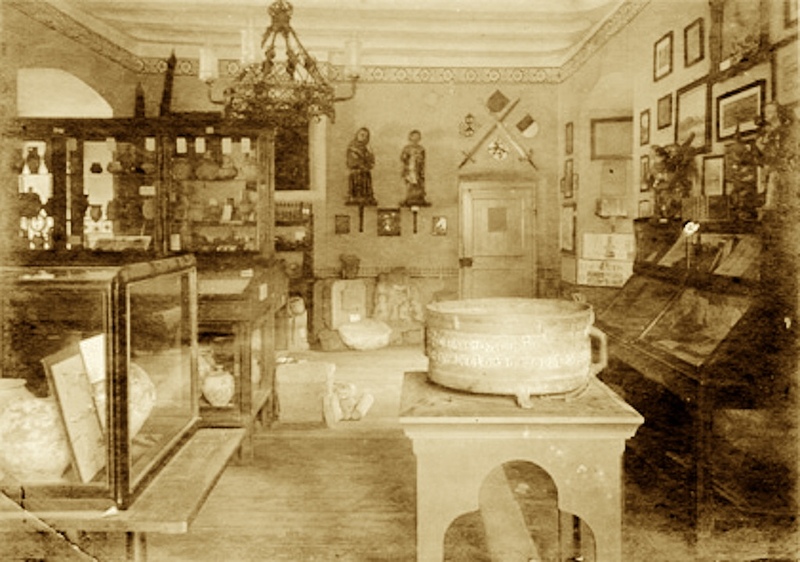 At the turn of 1911/12 a small municipal collection and other artefacts from Boppard became the basis for a new museum. 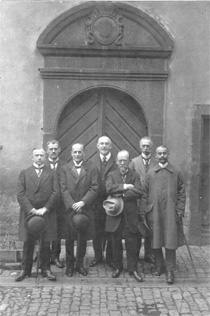 The emphasis initially was on archaeological finds, then in 1913 a personal donation by the artist Rudolf Stang became the basis for various special collections. At the same time the collection of everyday items and other objects grew. At the beginning of the 1930s the museum, run by volunteers, was accommodated in just a few rooms on the ground floor of the castle. After the war, Boppard museum was the only one in the area for a while. In the second half of the 1950s the mayor was a great supporter of the museum, following in the tradition of his predecessors. In 1981 a total of 42 ink drawings by the Boppard artist Nikolaus Schlad were put in the museum. This collection, with its views of the town, represents an impressive documentation of the townscape between 1834 and 1865. 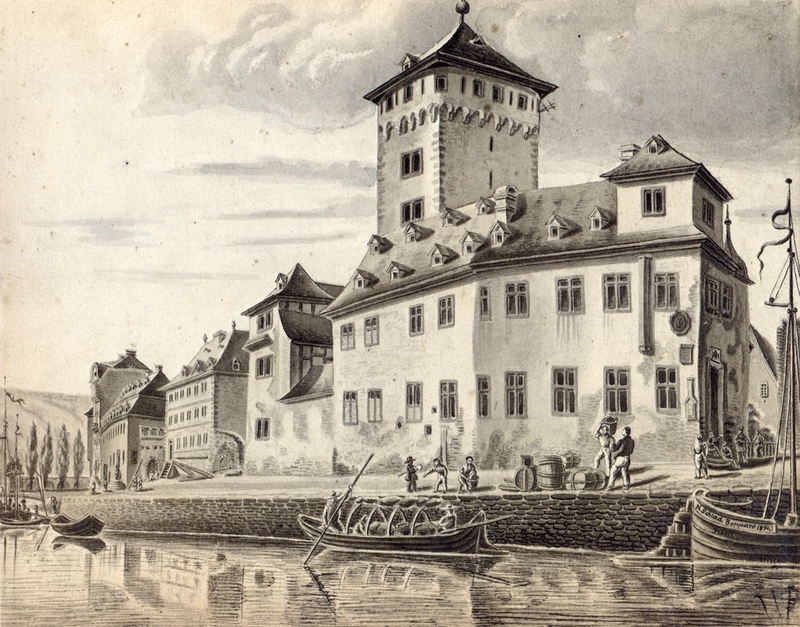 In 1977 the special collections were extended by work bequeathed by the artist Hans Jöres, which initially was housed in the South Wing of the castle. At about the same time a comprehensive redesign and enlargement of the collections and exhibitions took place. The topic of Thonet become the main focus and was updated in 1996, 200 years after the birth of Michael Thonet. Various temporary exhibitions followed, including, amongst others, one about the partnership between the Japanese town of Ome and the Japan researcher Philipp Franz Freiherr von Siebold, who lived for a time in Boppard. There is still a small collection from this exhibition in existence today. Modern-day artists also found and continue to find room for their work here. In 2005 extensive restoration works began, and in 2009 the museum was temporarily shut. The collection of around 3000 objects had to be moved to make room for the pending redevelopment work. In this phase of the building works, up until 2015, a new museum concept was worked on, which ties in with the current room situation and up-to-date knowledge. The castle itself including its building history has become a main focus of the new exhibition, alongside the topics of town history and Thonet.